Antiques shops in the New River Gorge Region specialize in providing a wide variety of antiques, as the region is becoming a popular antiquing destination. Antiques and other collectibles to be procured here include heirlooms from the New River Gorge and the surrounding mountains and tablelands. Coal mining implements and relics of the early mining era are still to be found. Products manufactured here after the Industrial Revolution are much sought after. Relics of the glass, coal, oil, timber, and pottery industries have particular appeal. Off the U.S. 19 expressway in historic Mount Hope, we’ve converted a hometown department store into one of the region’s must-see antiques shops. You’ll find vintage decor, unique gifts, flea-market bargains, rustics and primitives, country casual furniture, garden and architectural pieces, and a coffee corner for the less enthused. Open weekends — 1 to 5 p.m. Sunday, 10 a.m. to 5 p.m. Friday and Saturday — with extended summer hours. In the Fayetteville historic district, D&K Collectibles specializes in unusual antiques and West Virginia collectibles, including handmade glass, vintage souvenirs, and authentic coal-mining tools and equipment. 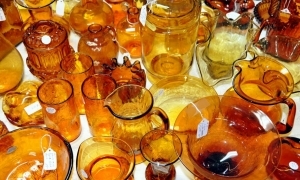 Owners Keith and Drema Wood are experts in the field of West Virginia glassware, most especially Blenko glass, and are renowned for their ability to find rare Appalachian heirlooms and heritage pieces from the Mountain State coal industry. J&J Antiques and More specializes in the provision of heirloom merchandise collected from throughout the Ohio Valley and Appalachian regions. On East Main Street, off the U.S. 19 expressway, the shop is easily accessible. Owners Jack and Jennifer Kelley take pride in their ability to choose and acquire antique furniture of the highest quality and inspect vintage pieces for authenticity. Staying attuned to the number of antiques shopping venues West Virginia is a complex task. If you know of a shop that’s not listed in our categories, please let us know or let the shop owner know of our guide to antiques shops in the New River Gorge.